Are you head over heels in love with your Cornerstone home and new carefree lifestyle? Let Cupid's arrow fly this Valentine’s Day and share the happiness... 💘💘💘 It’s so easy! All you have to do is encourage and refer your friends and family to visit a Cornerstone Homes community to experience what life can be like. Then leave the rest to us!!! When your friends and family buy a new Cornerstone home based on your referral, Cornerstone Homes will pay six full months of YOUR HOA fees - what’s not to love? And that means that morning coffee dates in your private courtyard and afternoon cocktails by the pool are even better with your new neighbors. 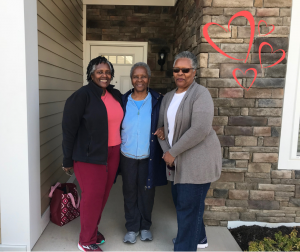 These 3 sisters love living together in Ashlake! From resort-style amenities like a clubhouse full of fun social activities, tree-lined streets with sidewalks, nature walking trails, Cornerpatch Gardens full of fresh veggies and fruits, and so much more, to a new energy efficient home with all the bells and whistles, life in a Cornerstone Homes community is as sweet as a box of chocolates. It’s time to share this luxurious lifestyle with the ones you love! Just ask Linda Monaghan, one of our homeowners who’s living her best life now. She moved into Barley Woods in Fredericksburg last July and says she couldn’t have made a better decision. 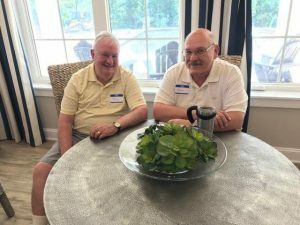 She especially loves walking to the clubhouse to meet her neighbors for get-togethers and social events, and of course, not having to do any exterior home maintenance. If you want your BFF, a family member, or a special someone to experience this carefree, fun lifestyle and live in an incredible and friendly neighborhood, now’s your chance to choose your neighbors. Share the love this Valentine's Day! We can’t wait to meet and welcome your friends and family! Please ask your Sales Manager for details on Cornerstone’s Referral Program today.